Impression share report is an underrated report. Be wiser than your competitors and use it to find powerful leverages to increase your Adwords campaign performances. What is impression share report ? increase the part of your impression share => more “targeted people” see your ads. Search Lost IS (budget): This is the share your ads lost due to an insufficient budget. This metric is only available at the campaign level. Search Lost IS (rank): this is the share your ads lost due to a poor ad rank. Search Exact match IS: the total of impressions your ads received only for the keywords exact match relative to what they could have received. There is also similar metrics for Display campaign: Display impression share, Display Lost IS (budget), Display Lost IS (rank). 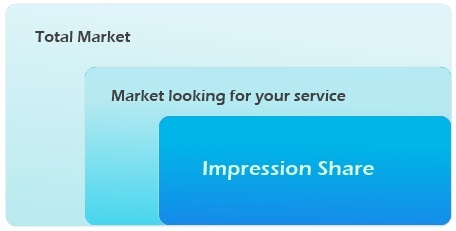 Impression Share report helps you to increase the visibility of your ads, the piece of the market cake you can advertise. Search impression share: it tells you the part of the audience you capture indepently of the keywords match type. You can know the size of your market by taking this number with the total number of impressions. Search Exact match (IS): it’s the part of the audience you capture only for the exact match keywords. Search Lost IS (budget): If you know the size of the part of your audience you lost, this one tells you how much you lost depending of your budget. Search Lost IS (rank): similar to the previous one, this metric tells you the lost part of your audience because of the rank of your ads. If you have well structured your Adwords account and campaigns, ad groups report is for example interested to watch carefully if your ads are really shown to people who count for you. The most important ad groups must have an impression share near 100%. You can use this number to measure the size of your market and to know if you capture the most possible part of this audience. Rank and budget informations are useful to know which modifications apply to your campaign to have better results. These metrics are available in the campaign, ad groups and keywords tabs. 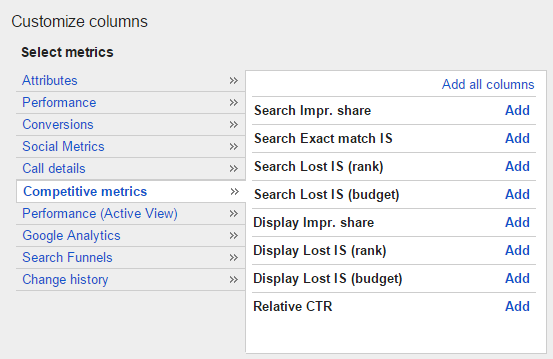 After having clicked on the “Customize columns” scroll down menu, you find the “Competitive metrics” to add all the Impression share metrics. Note that Search Lost IS (Budget) is only available in the campaign tab. By using the Impression Share metrics wisely, you can understand better your market, the performances of your campaign and the adequation of your budget. As these metrics are available for keywords and ad groups too, you can improve the impressions for a keyword which has very good performances. Impression share report is one the main reporting you can use to analyse, understand and improve your Google Adwords campaigns. This entry was posted in Adwords and tagged adwords, impression share, optimization. Bookmark the permalink.